Silence can help you live a better Life! Silence brings you to yourself. 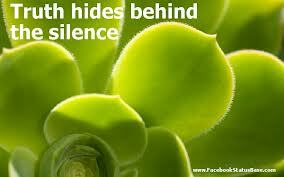 In the midst of a rushed day, try being silent. Don’t try to silence the environment. You just be silent. Peel off the sounds around you. Remind your mind that you cannot hear the sound that’s coming to you. As you peel off each sound you will attain the point of ‘shunya’ or nothingness. It is like peeling off layer after layer of an onion. What you are left with is nothing. Similarly silence can take you to nothingness. When there’s no worry, no grief, no anxiety, no guilt, no great, visible high-energy fist-thumping joy, when there’s no exulting, when there’s no unwanted thought, there’s simply you, floating in nothingness. It is in this sphere of silence, in nothingness that you will find the reason for your creation, the meaning to your Life. You will see how beautiful Life can be without all the mental chatter that goes on in your mind. You will then see the oneness is all creation and find that all your suffering is about things so transient, so impermanent. The mind, like the body, can be trained. But the mind, like the body, will resist the training. It will fight you. But you have to be dogged. When you anchor in silence, having silenced and overpowered your mind, you will see that Life is really lived ONLY in the present. No matter what your circumstance, you will be blissful living in the now! I chose the practice of silence during the most anguishing period of my Life. 10 years ago, I had no clue what was hitting us. Our business was falling apart. So were our lives. When I was advised to be silent, I laughed at the suggestion. I thought it was an act of cowardice. How can you be inactive and pretend to be unaffected by your crisis? But after a myriad attempts to fix things I chose to grudgingly accept our reality and began to practice daily silence periods. The effect was magical. It took me several attempts and over 90 days to perfect the art of remaining silent. But eventually I managed to conquer all the hurdles that came my way. Today, our problems remain aplenty. But my ability to deal with them has increased phenomenally. You too can benefit immensely. Just start with being silent. For some time daily __ maybe an hour. Investing an hour daily can help you get on top of the remaining 23 hours! Makes good business sense, doesn’t it? If you think it does, try it! Feel the magic of silence in your own unique, special way! Author AVIS ViswanathanPosted on February 5, 2013 March 14, 2016 Categories Art of Living, http://schemas.google.com/blogger/2008/kind#post, Intelligent Living, Mouna, Silence, Sphere of SilenceLeave a comment on Silence can help you live a better Life!